Today’s major event is the Nobel Peace Prize, which goes to the International Panel on Climate Change (IPCC) and to Al Gore, for their tireless work on raising the public awareness on man-made climate change. This recognizes in perhaps the best possible way that global warming has to be fought against. The Nobel Committee was particularly struck by (t)heir efforts to build up and disseminate greater knowledge about man-made climate change, and to lay the foundations for the measures that are needed to counteract such change. Indications of changes in the earth’s future climate must be treated with the utmost seriousness, and with the precautionary principle uppermost in our minds. Extensive climate changes may alter and threaten the living conditions of much of mankind. They may induce large-scale migration and lead to greater competition for the earth’s resources. Such changes will place particularly heavy burdens on the world’s most vulnerable countries. There may be increased danger of violent conflicts and wars, within and between states. Whereas in the 1980s global warming seemed to be merely an interesting hypothesis, the 1990s produced firmer evidence in its support. In the last few years, the connections have become even clearer and the consequences still more apparent. Al Gore has for a long time been one of the world’s leading environmentalist politicians. He became aware at an early stage of the climatic challenges the world is facing. His strong commitment, reflected in political activity, lectures, films and books, has strengthened the struggle against climate change. He is probably the single individual who has done most to create greater worldwide understanding of the measures that need to be adopted. I find it absolutely great that the cause of mitigating climate change receives the Nobel. It is worth mentioning that the environmental cause already received Nobel Prizes as in 2004 it was awarded to Wangari Muta Maathai for her reforestation program, The Green Belt Movement, in Kenya. Official press release from the Nobel Committee. IHT | Financial Times | WWF press release. 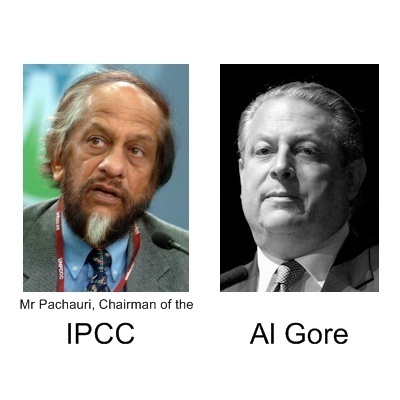 Taken from the official press release of the Nobel Committee for Mr. Gore, and as there is no logo for the IPCC, I took a photo of Rajendra K. Pachauri, the chairman of the IPCC. An Inconvenient Truth movie trailer.